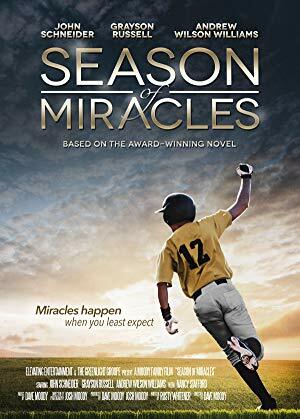 Storyline: Based on the award-winning novel by Rusty Whitener, Season of Miracles follows the Robins, an underdog Little League team through their 1974 season with newcomer and autistic baseball savant, Rafer (Grayson Russell, Diary of a Wimpy Kid, Talladega Nights). Team leader Zack (Andrew Wilson Williams) takes Rafer under his wing despite taunting from their rivals, the Hawks. Their Coach (John Schneider, The Dukes of Hazzard, October Baby), manager Rebecca (Sydney Morgan Layne), and the rest of the Robins encourage Rafer as the team rises towards an unlikely championship season, that is less about winning and losing and more about living and dying. Season of Miracles is a life-inspiring story about sportsmanship, friendship, and courage in the face of adversity.